Some events have the power to separate your life in two spectacular parts- Life Before it and Life After it. Your Wedding will always top that list. Finding a perfect life partner is a dream when realized makes your life- a total bliss. While it is a heavenly union of two humans and their families, every wedding has its own share of fun, madness and crazy incidents. There is one ritual that is solely yours and always perfect to look back on your wedding day- Taking Your Wedding Vows. The promise to be forever and the moment from when your heart got its beat is an overwhelming feeling that cannot be lived just once. Your vows will serve to be an intimate yet public moment during the wedding; where you will express your dream and commitment to be with each other- no matter what! While most of the couples go the traditional way to make their promise in front of their families and friends, many are bringing newness to personalize this moment. Whatever you choose- remember your love is one of a kind and just celebrate it! Memorable wedding vows is all about speaking your heart out, abiding every word you say and capturing the moment in a cherished way. It is an overwhelming feeling that cannot be felt entirely in just one moment. Now you have the chance to relive them again with theme based wedding photo books and photo calendars. To hold their hands and feel the power of lifelong commitment on your special days- best way to reminiscence your wedding vows is to preserve it in superbly designed wedding special personalized photo books or wedding photo calendars. It is a moment of beauty to reflect on your relationship and see how it has grown through your journey. Tell your spouse why you love them, what makes your days more special with them and appreciate the small gestures they make to grow your bond stronger each day. On your anniversary- sweep off their feet as make your own photo book that lasts- just like your love. Choose to gift Personalized Photo Calendars. With Picsy in your hands, it is a cake-walk to create your photo book online. 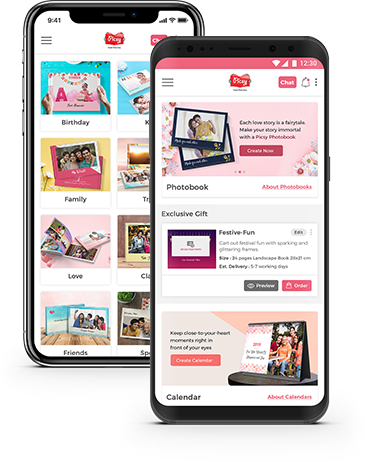 Just download the app, select your chosen theme to create your wedding special personalized photo books in three easy steps. Gift wrap and opt for a personal note. And we deliver your wedding photo albums right at your door step- anywhere across the globe with a smile. Seal the deal to simply ‘Wow’ your spouse, flip through your ‘vow’ pages laden with romantic messages of eternity-dipped photo books. You can choose to gift personalized photo calendars to fill up the entire year with ‘love-at-every-sight’.